In the tour, virtual visitors can view panoramas that showcase academics and athletics facilities, campus apartments, the Wick Campus Center, and other college buildings and spaces. Exterior images of the facilities are complemented by interior photos that give a more in-depth look of selected buildings. Prospective students will also soon be able to engage in a real-life Daemen campus experience right from college fairs and other recruitment events with the use of Google Virtual Reality Viewers. The cardboard viewers have cutting-edge technology that works with a smartphone to allow the user to feel as though they are literally on campus. 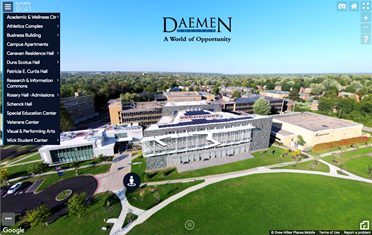 Daemen’s tour is accessible on a laptop, mobile or other electronic device at daemen.edu/virtualtour.